I never titled my short pieces in college, which seemed to bother my English professors something fierce. Made little sense to go into something with a title already in mind, and if nothing jumped out at me once I was done, it felt forced or cheesy to slap something on just to do so. Now I seem to suffer too frequently from multiple options. Meh, so I put ‘em both up there. Democratic bloggery: you decide, I don’t want to. Another week, another questionable decision in the form of the Soldier Field 10 Miler. Same spiel as last week’s 10k: the early morning grumble, trying to figure out how to fuel effectively, the pre-race contemplation of everything centered around “Why am I doing this?” and so on. First time I’ve done this one on my lonesome, as it wasn’t a CARA circuit race this year (more on this later) and as previously babbled about, don’t really work with folks interested in fitness as was previously the case. Related, I’m a hermit with no friends interested in running. No bother, just meant I listened to increasingly embarrassing music on my drive in while dropping Cheerios everywhere. Given my inconsistent build-up in the past two months, can’t complain about my outcome. Gravitated to the 1:15 pacers, because I was blissfully unaware of them existing until earlier this week while skimming the event guide, so that seemed like a solid idea. 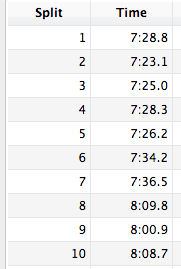 Clicked off 7:30s through mile 7, then…didn’t. I look at that and cringe, but I've crashed harder and frequently, so it goes. I don’t know if it was an energy thing, probably a mental block I struggle to admit thing or just leaning hard on that crutch of I haven’t run eight miles since…sheesh, the end of March, but the slow-down happened and I was ok with it (as much as I can be). I could have battled a bit more for a few seconds faster come the finish, but I didn’t really feel like a head-down struggle and actually took in the lakefront scenery. Hey, that skyline is pretty sweet. Wouldn’t have known otherwise. According to my Garmin stats, I went through 6.21 faster than I ran my 10k in last week by over 20 seconds, so the trend continues on. Bully for me? Sigh. So goes on my successive PR streak, 43 seconds quicker than last year. Stubbornness begets strength begets speed begets endurance. I’d like to change that. Perhaps the most notably strange component of the race from a sheer observational standpoint was near mile 7 or 8, where the DJ facing towards the masses in the early miles of the course (for those unfamiliar, consider it a close to out and back course, with slight variation in the first mile+) started to play one of the most melancholy Coldplay songs imaginable. I thought maybe I was imagining it, but no. That was selectively being blasted for those just getting out on the course a shade past 8a. Was no standard-issue Black Eyed Peas song available? Crowd support is one of those funny things for me that’s nice or super irritating, but for someone perhaps running in this thing as a big build-up event of excitement and pony-rainbows of accomplishment, I can’t imagine hearing that with eight-ish miles remaining and in any way being SUPER AMPED TO RUN MORE. As I was walking back to my car, past the music and the beer and the post-race festivity, I couldn’t help but think about whom all that was for, as it certainly wasn’t for me, a salt-stained curmudgeon who wasn’t satisfied with a PR and just wanted breakfast. I signed up for this back in October with aspirations of a sub 70 minute finish on a course of which I was familiar and knew was pretty flat, and I don’t know what my 70$ got me beyond sounding really snotty in saying that "it went ok, even though I PR'd." 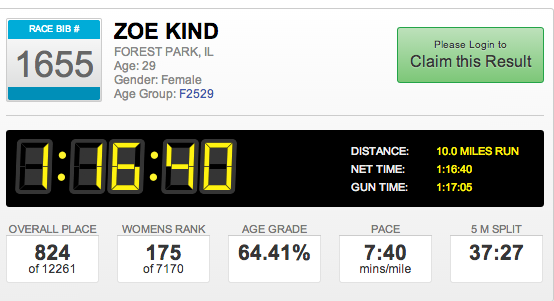 Yesterday, I ended up the 175th lady out of over female 7,000 finishers. Did they get what they wanted out of it all? Maybe this rant is compounded by my baffled reaction to seeing that a late summer half marathon, put on by the same folks as this event, is already 90$ dollars to enter. Nine Zero. I don’t like paying more than 60$ for a half, and was a bit uncomfortable entering this 10 Miler for 65$ (plus processing), but did so out of strange goals and…tradition? Don’t think it will be in my 2015 plans. I’d love if my entry fee was transparent and I knew how much it cost to run on Lake Shore Drive NOT next to oncoming traffic. I’m happy to pay for that and if that’s why the entry cost rises, so be it. Not quite sure what else would serve to satisfy, though. Guess the takeaway questions become what is the comfortable price point for an experience, and when does it stop being about a race? I wonder if that factored in to it not being on the CARA circuit (I doubt it, but could be wrong). Not interested in the mud/foam/pit of doom/color/princess/obstacle anything ventures all over the place, and if you are, I salute you. They look like fun. I want a cotton shirt, a safe clean course and maybe a bagel (but there are no decent bagels anywhere to be found so maybe not). Damnit, the allure of lo-fi, no frills races from the days of yore, not even MY yore, make me feel like an old man. Had a day to chew on things, and I’m slightly disinterested in signing up for anything over the next six to eight weeks. Given what I’ve done in the past two races makes me pretty excited to build towards a solid fall effort, but I’m just a bit race sour at the moment. I’ve actually been thinking I may take that un-spent race money and put it towards a coach. You know, so I can stop writing about running like an idiot. But for now, look for more thoughts on training, getting back on the track this week (yay SPEEDWORK!) and this relay thing in two weeks.